Place granola bars in large resealable food-storage plastic bag; seal bag and crush with rolling pin until fine crumbs form. In medium bowl, mix crumbs and melted butter until well combined. Place about 1 tablespoon of the crumb mixture in each of 18 mini cheesecake cups with removable bottoms; press to form crust. In small saucepan, combine water and gelatin; let stand 5 minutes. Heat over low heat, stirring constantly, until gelatin is dissolved. In large bowl, beat cream cheese and powdered sugar, yogurt and dissolved gelatin on low speed until blended until creamy. Spoon cream cheese mixture evenly (about 3 tablespoons each) over crust in each mini cheesecake cup. Refrigerate about 1 to 2 hours or until completely firm. To serve, run knife around edges of muffin cups to remove cheesecakes, serve immediately. Decorate with fresh fruit, as desired. Store in refrigerator. If using a regular muffin pan with paper liners, follow recipe as is. It makes 18 mini cheesecakes too. 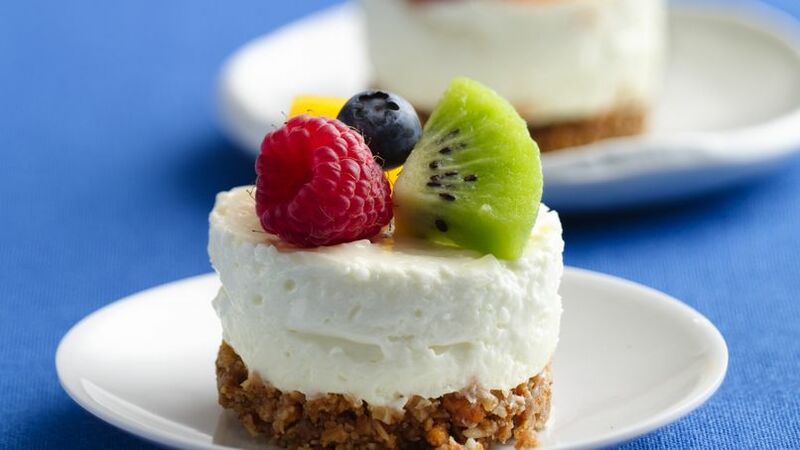 These mini cheesecakes are made without baking: tasty, easy and delicious.